Dream Green visits Ames to learn about PowerFilm, Inc, a publicly held energy company in the solar sector. This innovative solar manufacturing company is a component of the London Stock Exchange Index PFLM and partners with the military, Hewlett-Packard and several dozen other companies to create applications and products for their photovoltaic flexible thin solar film. The J ap an Aerospace Exploration Agency used PowerFilm Inc. photovoltaic thin film in the world’s first solar sail powered deep space satellite. [wikipedia]. ISU grad Dr. Frank Jeffrey co-founded the company in 1988 with Dr. Derrick Grimmer, both former 3M research physicists. Dr. Frank Jeffrey, PowerFilm, Inc, CEO & co-founder. Tim Neugent, PowerFilm, Inc, COO & president. Also, Dream Green heads to Ankeny for a visit to the headquarters of the Iowa Association of Municipal Utilities. 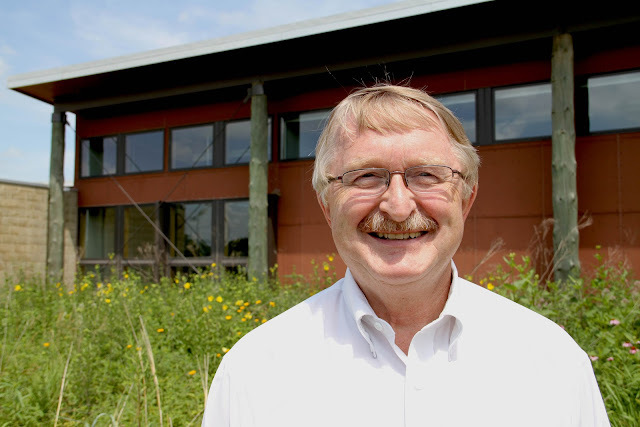 This nationally-recognized LEED-certified sustainable facility, designed by architect Kevin Nordmeyer (current directo r of the Iowa Energy Center), is situated on 26 acres of land that includes 11 acres of native Iowa prairie, and consumes less than 50% of the electricity of a conventional building of its size. Organized in 1947, the Iowa Association of Municipal Utilities is the largest organization of its kind in the country. IAMU represents more than 550 municipal electric, gas, water and telecommunication utilities statewide, and maintains a marketing relationship with more than 185 associate member businesses. Bob Haug has been executive director since 1986. Bob Haug, IAMU Executive Director.